TAM will initially offer three São Paulo-New York round-trips each week with A350-900s, later increasing its A350-900 utilization on the service to a daily round-trip. 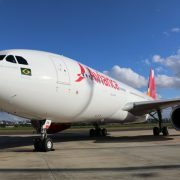 The induction of Avianca Brasil brings a Star Alliance presence back to South America’s largest air transport market, after former Star member TAM Airlines left the alliance on March 31, 2014 in order to join the rival oneworld alliance. TAM Airlines expects its first Airbus A350-900 to arrive in Brazil in December and to schedule its first commercial flight with the type for January 2016, on the long domestic sector from São Paulo Guarulhos International Airport to Brigadeiro Eduardo Gomes–Manaus International Airport. LAN Airlines and its affiliates and TAM Airlines have opened LATAM Airlines Group’s first official unified VIP Lounge, which is located on the mezzanine floor of the departure area of the new Terminal 3 at São Paulo Guarulhos International Airport. The LATAM Airlines Group has announced five new long-haul international services it plans to begin in the next 15 months, to strengthen the group’s connectivity in Latin America, North America and Europe. US Airways is launching daily non-stop service to São Paulo in Brazil from Charlotte in North Carolina, its largest hub, on June 8. The airline will operate its service to Brazil’s largest city with Boeing 767-200ER aircraft seating 18 in Envoy and 186 in the main cabin. The carrier will operate three-times-weekly round-trips to Brazil with Boeing 787-8 widebodies from Addis Ababa. The flights will make an intermediate stop at Ethiopan Airlines’ second hub at Lomé-Tokoin Airport in Togo. If its application is approved, Delta Air Lines would begin second daily São Paulo flights to both Atlanta and New York JFK this year. Pending government approvals, American proposes to begin new service between Los Angeles International Airport and São Paulo Guarulhos International Airport in late 2013 and between Chicago O’Hare International Airport and São Paulo in late 2014. US Airways will launch daily non-stop service to São Paulo, Brazil’s largest city, from its largest hub at Charlotte on May 5, 2013. São Paulo is US Airways’ second destination in South America and the route complements the airline’s existing Charlotte-Rio de Janeiro service. Etihad Airways is keen to expand its footprint in South America and is in discussions with South American-based carriers about potential commercial partnerships, according to James Hogan, the airline’s president and chief executive officer. American Airlines will launch 17 additional weekly flights between the United States and Brazil this fall, having receiving approval from the U.S. and Brazilian authorities. The new non-stop flights will depart from São Paulo Guarulhos International Airport (officially called Governador André Franco Montoro International Airport) to Montevideo in Uruguay, Asunción in Paraguay, and Santa Cruz de La Sierra in Bolivia. American Airlines has announced the initial flight schedules and markets for its first group of Boeing 777-300ERs, which will enter the airline’s fleet from December. On December 13, the Dallas/Fort Worth-Sao Paulo route will be the first to feature American’s Boeing 777-300ER. AeroMexico has signed an agreement with Brazilian carrier TAM Airlines to codeshare on flights between Mexico City and São Paulo, as well as on connecting flights to domestic destinations in both Brazil and Mexico. GOL Linhas Aéreas Inteligentes plans to offer five-times-weekly service with Boeing 737NGs from Guarulhos International Airport in São Paulo to Simón Bolívar International Airport in Maiquetía, near Caracas. The flight would continue on to Miami International Airport. Singapore Airlines will begin services to Sao Paulo in Brazil on March 28 March, subject to receiving regulatory approvals for the new service. GOL will offer three daily round-trips to Aeroparque Jorge Newbery from São Paulo’s Guarulhos International Airport, one of them originating and terminating at Tancredo Neves International Airport, which serves the city of Confins in Minas Gerais state.